Three layers of paint are responsible for producing the glowing luster of a new vehicle as it rolls off the production line. The first layer is the primer, to act as a base layer, and give the next coat something with which to bond. Then comes the second layer of paint to provide the car with its specific color. Over the second coat goes a third, clear layer to add protection against the elements. It’s the third coat that is responsible for protecting the underlying paint and metal against oxidation, small scratches, and provide a longer lasting paint job in general. When one or more of the layers of paint lose their adhesion to the underlying surface, paint peeling ensues. The problem can be caused by the primer losing adhesion to the underlying metal, or the third clear coat becoming unstuck from the second. A poorly prepared surface may also contribute to the problem as the primer will lose its bond with the bare metal over time. In most cases, the preparation of the surface is the key to preventing peeling paint in the first place. 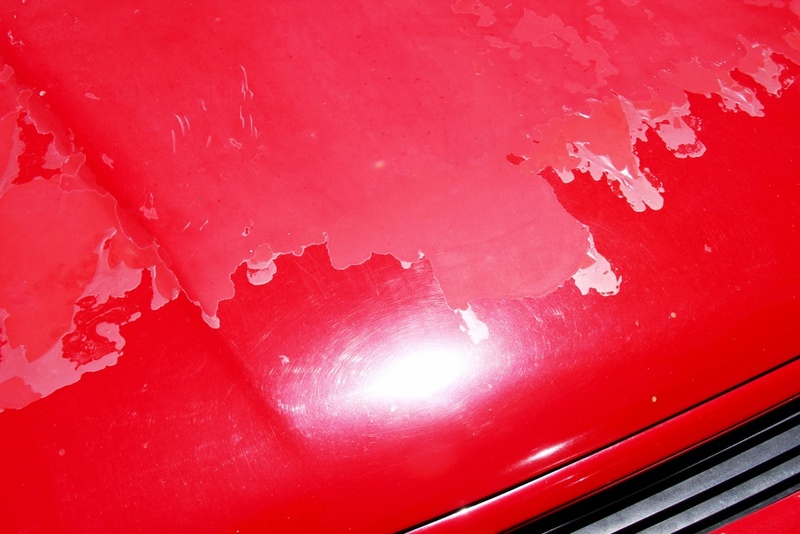 The biggest reason many older vehicles have paint that peels can be attributed to a problem in one of the three layers, and in some cases more than one. Another cause of peeling paint happens when the surface is compromised by a scratch or dent. Once surface integrity has been compromised, contaminants can enter beneath the paint surface, and put the paint job firmly on the road towards delamination. However, this is a rare occurrence and is more indicative of a low-quality preparation procedure. There are two options when this happens to your vehicle, depending on the severity of the damage and the amount you can justify spending on repairs. Both options involve bringing your vehicle into a body shop to have the issue assessed and quoted. Your body shop can either quote you to repaint the specific area where the peeling is happening, which will definitely be the lower-cost solution. They will be able to closely match and repaint the area in question. The second, costlier option would be to repaint the entire vehicle. If you own a classic or collector vehicle that is valuable to you, this is probably the better bet. Having your vehicle stripped, sanded and repainted will result in it looking like it just rolled off the lot brand new! Regardless of how you decide to repair the damage, your trusted body shop will be best in helping you get your vehicle back to its best condition.